Since its inception, SBSE has supported many different software engineering activities, including some which aim on improving or correcting existing systems. In such cases, search results may propose changes to the organization of the systems. Extensive changes may be inconvenient for developers, who maintain a mental model about the state of the system and use this knowledge to be productive in their daily business. Thus, a balance between optimization objectives and their impact on system structure may be pursued. 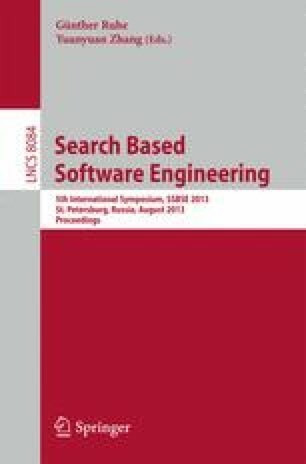 In this paper, we introduce incremental search-based software engineering, an extension to SBSE which suggests optimizing a system through a sequence of restricted search turns, each limited to a maximum number of changes, so that developers can become aware of these changes before a new turn is enacted. We report on a study addressing the cost of breaking a search into a sequence of restricted turns and conclude that, at least for the selected problem and instances, there is indeed huge penalty in doing so.